Yesterday evening, I ended up with some unexpected guests. One stray cat who has been around a lot lately recently had kittens. (I figured it was that or she was really quick at gaining or losing weight.) 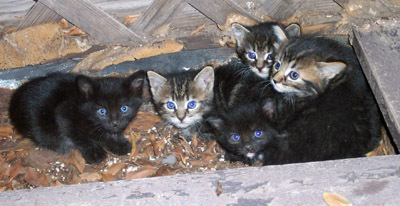 Last night was the confirmation on the kitten part was she showed up on my terrace with 5 adorable little kittens. I wish I could just adopt them all but I will probably try to find homes for them so they aren’t left on the street. Here are the kitties in all their cuteness.